Inspiring Ideas with artist Jeanne Winters: Evergreens for Everywhere! Time to decorate! 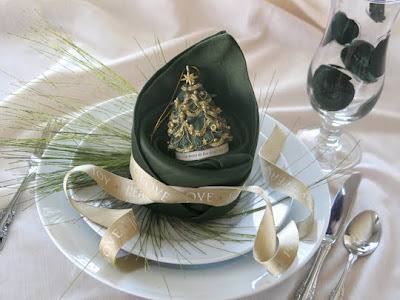 Love those evergreen boughs ... fake or not ... let's do it! 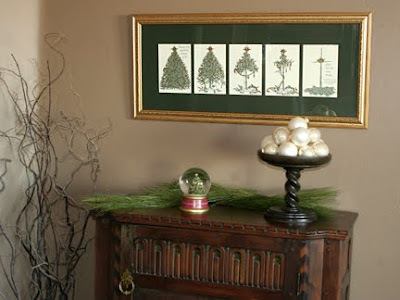 A Christmas print replaces an everyday one, while white ball ornaments fill a footed plate and evergreens complete the clean look: An ornament is ready to be gifted to a dinner party guest and a swirl of faux greens sits underneath: . . . . . . . . . . . . . . . . . . . . . . . .
"How Does She" is featuring my gift card packaging idea today! 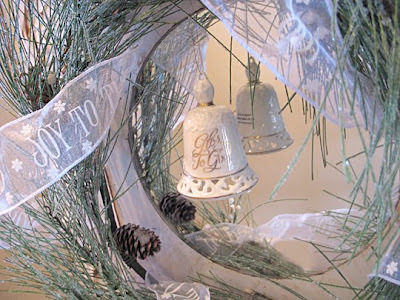 Shelley, Missy and Alison have a terrific site loaded with fun craft ideas worth checking out! Their top post is a little block ornament that they customize 10 different ways! There are plenty more little Christmas gifts to do for everyone on your list! If you blog, visit sweet, hilarious, cutie Lisa at A Preacher's Wife and link up with a post about "How You Christmas" ... and have a chance to win my book Inspirational Home OR an art print from my Etsy store! Merry SITSmas to all the lovely ladies coming from SITS!! For pics of holiday homes from other bloggers visit Tip Junkie! Wow everything looks so beautiful and elegant! I love it! Merry SITSmas to you! I hope you and your family have a wonderful holiday season! LOVE LOVE LOVE that ribbon! And the decorating! wow - so very gorgeous! I'm off to visit those sites - but first Merry SITSmas! What wonderful ideas! I will have to keep them in my memory file as my kids are destroying my decorations this year with no remorse! I like your style of decorating. Mine tends to go overboard too much. Simpler CAN be better! 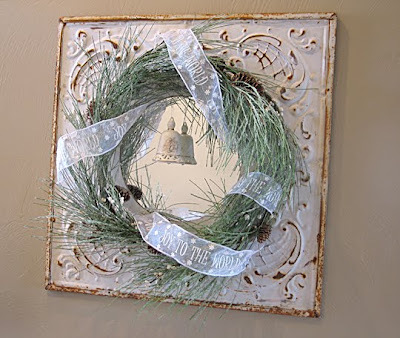 Merry SITSmas... Tonight i am attending a centerpiece class made from fresh evergreens, last weekend we made fresh wreaths... so much fun and the smell is awesome... your house is beautiful! love your style..your blog is full of inspiration! thank you so much for visiting my blog! you have some GREAT ideas! I might be stopping by again and borrow some! Merry SITSmas! So very elegant indeed! Hope you had a very merry SITSmas! Lovely decorations! 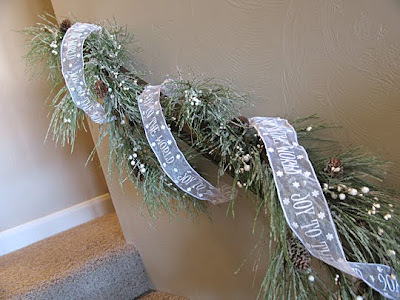 Gives me some ideas for my house, since I've haven't decorated yet! Thank you for stopping by my blog! I hope you and your family have a wonderful Holidays and Merry SITSmas! Love the decorations!! Merry SITSmas to you!